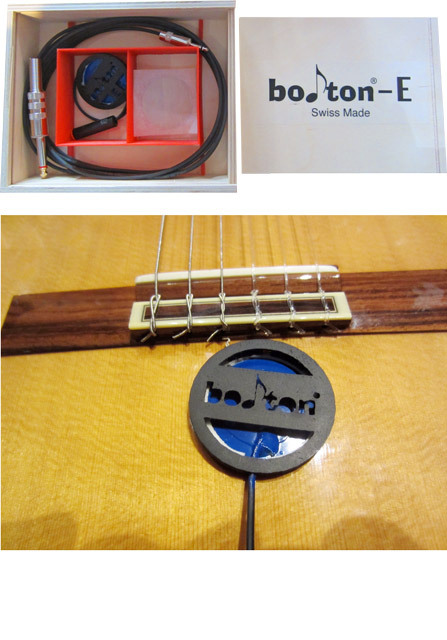 The boton®-E is a new pick-up for the external use on any stringed instrument and is based on the well-proven boton® P 41. The boton®-E‘s body is made of a special, organic plastic (PLA) and produced using 3D printing, which reduces the overall weight to about 6 g.
The boton®-E pick-up comes in a nice wooden box with a piece of putty (2g) and a custom 3m cable. The putty is designed for stringed instrument tops and guarantees an ideal signal transmission. Its grip on the surface is strong, but it can always be easily removed and used again. The boton P 41 E‘s low weight does not affect the accoustic characteristics of an instrument.